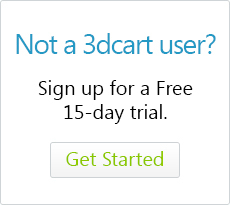 The following steps will allow you to integrate your 3dcart store's products with Facebook Ads technology. For information on setting up and using your Facebook ads account, please click here and here. Facebook Ads integration is currently available as a beta release on 3dcart Professional, Enterprise and higher accounts. In order to use Facebook ads, you will need a Facebook profile and a business page associated with that profile. Be sure you are logged into your facebook profile before proceeding with the next steps. This action will bring up the Facebook Ads module. When first setting up the integration, you'll use this module to connect to your Facebook ads account. Clicking on the button will open up a popup window which will take you through the process of selecting your Facebook Page, installing the Facebook Pixel that is used for tracking and importing your products to Facebook. After the initial set up is complete, you will be able to create your Facebook ads as needed. Please refer to Facebook's documentation for creating and using the ads. After completing the integration process, you will be able to return to the module to view the status of your product synchronization on Facebook Ads. You may also use this page to disconnect your store from the Facebook Ads and disable pixel tracking. Next to each status will be a number indicating how many of your products fall in that sync status. You may click on the number for Synched and Pending to view more details about the products and why they are in the given status. For example, under "Pending" status, you will be able to review products and the reasons why they have not fully synched (See Additional Information below). You will then be able to click through directly to the product in your store to make changes and have the product resubmitted. If using Advanced Optins, the SKU on the option level is required as this will be the ID used to identify the specific product variation.